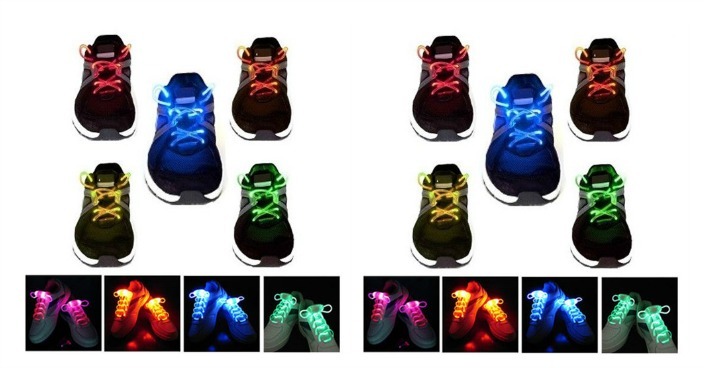 LED Waterproof Light-Up Shoelaces Just $4.99! Down From $30! Ships FREE! You are here: Home / Great Deals / LED Waterproof Light-Up Shoelaces Just $4.99! Down From $30! Ships FREE! GearXS has this LED Waterproof Light-Up Shoelaces on sale for $4.99 (Reg. $30) + FREE shipping! A\Stand out from the crowd with these LED Waterproof Light-Up Shoelaces. These shoelaces come in five different colors: Red, Orange, Green, Yellow and Blue. They are easy to use and made from durable materials, so they will last. LED Waterproof Light-Up Shoelaces light up your “kicks” and let you break out on the dance floor in style! Perfect for parties, night activities, safety, and all kinds of night life fun! Great for any type of lace-up shoes such as skate shoes, roller skates, roller blades, ice skates and more!